What type of your VIO? VIO diagnosis. You will not out pubic hair from the back or side of the underwear. 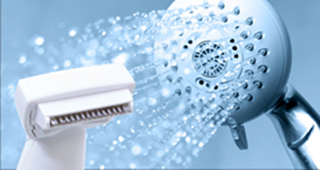 Pubic hair specialized shaver for both I line and O zone. This is a battery powered shaver with a focus on safety with a special blade for the sensitive parts. Also, it’s useful for trimming various pubic hair styles. T-shaped electric shaver for shaving the I line. The shaver has a T shaped head and is made for shaving difficult to access parts like the base of the thighs. The blade is specialized for the bikini line and doesn’t over shave which makes it less likely to get pigmentation and ingrown hairs. Special blades that can handle even hard bristles. It is compact but well designed for shaving even hard and thick pubic hair. It allows for quick shaving for big volume areas too. It can even lift the hair up and shave so it has an excellent ability to create different styles like square or oval shapes. Water-resistant specifications that can be used in a bathroom. ※Since it can not shave deeply, it does not become a finish of slickle like pulled out from the root. ※If your skin is rough please never use it. Please do not use people with weak skin, those with allergies. ※For those who are weak to the skin we recommend Ravia's heat cutter. 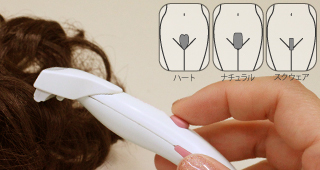 ※Pubic hair is different from person to person. Therefore, there are individual differences in the effect after use. ※If you do not use it for a while, please remove the battery and keep it.When thinking that sharpness has become worse, please put a new battery first and try. ※Please use after confirming the instruction manual of the product carefully. If you do not have a store sign in the warranty card after purchasing, please write it yourself. Since the warranty card is also used to confirm that it is our product, please keep it carefully even after the warranty period expires. We are requesting presentation at repair and replacement. © 2019 KOEI KOGYO CO.,LTD. All rights reserved.